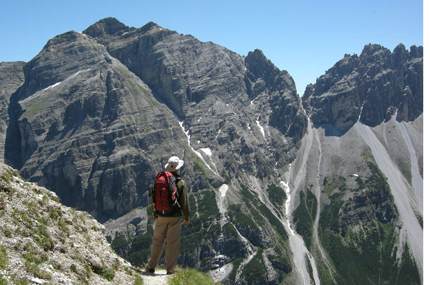 What equipment do you need for hut to hut walking in the European alps? Not much, is the answer. The whole point about hiking in these mountains is that you can do multiday walks without the huge backpack of the Australian bushwalker. No need for a tent, sleeping bag, cooking gear or days worth of food or a large 70 litre pack. Therefore you can walk faster and more freely. To the left is a list of what I take personally for this type of walking whether it be 7 days or much longer. There are some items on this list that you may wish to leave off such as mini tripod, book, phone, sandals, even trekking poles. However, rest assured - if it is not on this list you don't need it. By far the most important item of equipment is a robust, comfortable pair of walking boots. 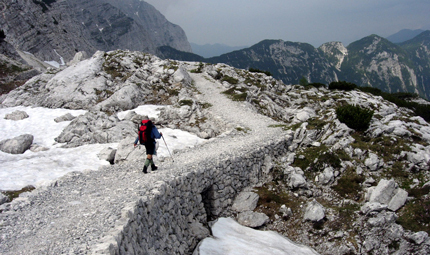 The walking surfaces vary enormously from vehicular tracks to steep and rocky trails. Leather walking boots such as the Asolo TPS 520 are excellent but in my opinion the best boots for walking in Europe are lighter boots that have a good midsole such as the Asolo Fugitive or Revert. Your pack should be in the 35 to 45 litre category. All you need to carry is your hiking clothes, a change for the hut and some extra bits and pieces. Your pack should weigh no more than 8 to 10 kg. Obviously it is more efficient to walk with someone else where a number of items are shared such as First Aid, map, phone etc. The huts often have a selection of board games and cards but if travelling alone a book is essential. 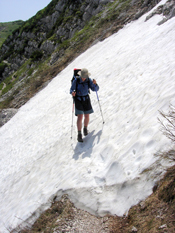 It is not necessary to take technical equipment such as crampons, ice axes, harnesses etc for normal walks. But be mindful that this is a high alpine environment and the walker is responsible for their own safety. If in doubt about the route ahead consult with the hut warden who is usually only too happy to assist. Spare footwear can be eliminated if you wish because the huts supply scuffs to wear inside (wearing boots inside the huts is not allowed) but I have always preferred to take my own. If you are happy to wear footwear that has seen many other feet you can save weight here. Also I find having a proper pair of sandals or runners allows you to go on short jaunts around the hut without the need to put your boots back on. The huts usually have a boot room somewhere near the entrance. This doubles as a drying room which will normally operate in wet weather. A torch is essential as some huts switch off the power late in the evening and a sleeping sheet is mandatory. The huts always supply pillows and blankets or doonas but you must have your own sheet. Most important of all is to have a good hiking map. Much more important than a guide book in my view. 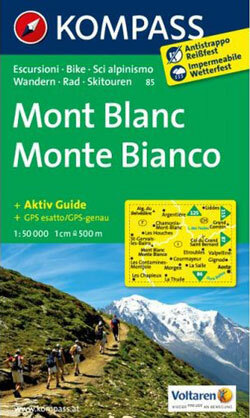 Luckily Bogong stocks a range of European maps so you can plan before you go. In such vertical terrain the most useful navigational aid is a wrist altimeter. I own a Suunto Vector, now replaced by the Suunto Core and it is has accompanied me on many thousands of kilometres throughout these mountains. I strongly recommend that you get a device like this. All clothing should be quick dry. I find it best to have one shirt which I walk in every day and change into a second one when I arrive at the hut after a quick cleanup. The walking shirt can be rinsed out if necessary for the next day's walk. I prefer a long sleeve shirt personally as it gives both sun protection on sunny days as well as more protection in windy weather. A good set of rain gear is essential as like all mountain areas protracted periods of wet weather can occur and they work as wind proofs when required. I have listed mini crampons as optional. Snow can of course fall and freeze in these mountains at any time but I do not ordinarily carry crampons. However at times they would have been useful. 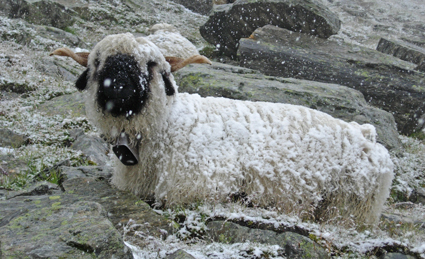 Obviously snow is more likely earlier in the season in June and early July. It is up to the individual to assess the season, conditions and route. I have put a phone on the gear list and I consider this mainly as a safety item. Mobile coverage is common even in the mountains in Europe, particularly as you get to high points during the day. Huts never have public phones but usually have a connected phone that can be used in an emergency and they will usually happily ring the next hut to book if required. Note power points to charge electronic devices are often at an absolute premium in huts. Water purification tablets should be carried. In the higher mountains I have found water to be fine to drink but if you need to access water in the lower meadows you will readily observe cows, sheep and goats are sharing your environment and prudence would suggest that you should treat the water. I have had one bout of gastro from such a source and this was certainly one too many. Check out the blog All About Walking in Austria to find out about walking in this amazing country. Apologies for not answering your comment sooner. Our software failed to send an alert. Due to demand the powerpoint situation is gradually improving but it is seldom good. Huts are never on the grid and as such generally have limited power resources. There is occasionally a power point in the common eating room, very occasionally in the dorm. More typically powerpoints will be in the washroom which is less than ideal. My observation is that where points are available, and if the hut is full, there is a queue for access. My experience is that if you are prepared to wait for a day or two you will eventually be able to charge. I guess the point is that if you really feel you need to rely on electronic devices you should take your own solution such as a solar charger. I am travelling to Austria in about 4 weeks and shall write an update on this information on my return. Can you elaborate a little on the power point situation in huts? Is it that the huts do have power points in the sleeping quarter, but lots of people are lined up to charge up their iPhone? 1. Lunches. The response from huts is somewhat variable in my experience. Although in many places there is often a half way hut on a days walk so you eat lunch there. If you want a lunch pack you should always discuss this with the hut the day before and usually they are happy to oblige. It is a good idea to carry some biscuits and cheese as a back up. As I mentioned you can virtually always purchase snacks such as chocolate, Mars bars and often packets of trail mix (nuts & seeds). 2. Altimeter. The terrain is steep and usually the key navigational question is "how far is it to the top of the pass". The altimeter will tell you this much better than a compass or the map. For example if you know you have 1,000m climb and you have climbed 500m then you know you are half way. This is very useful for pacing your effort and eliminates moral sapping false summits. Although I always carry a compass I find I seldom use it but the altimeter, particularly being so accessible on your wrist. Thankyou for a fascinating and informative series of blogs on this subject. I'd heard about these before, but never in such detail, and never from somebody who's had such vast experience through the area. 1) Do you typically purchase your lunch and snacks from the huts? 2) I'm interested to find out why the altimeter such a vital piece of equipment as a supplement to the maps.